In 2016, John Woodbury, a senior vice president at Wakefield, Mass.-based HCC Specialty Underwriters Inc., quit after 20 years to work for a rival company, the Portsmouth-based Buttine Underwriters Agency. He took a photo of the company’s financials on his cellphone and kept e-mail of his clients on a computer at home. Within a few months, he was soliciting his former contacts and dismissing a non-compete agreement he had signed as unenforceable. Both men settled their cases out of court. The cases illustrate the wide-ranging nature of non-compete agreements, which have become increasing controversial. California banned them last year. Massachusetts passed a law that went into effect in October that severely limits them. And in New Hampshire, a state senator is proposing a law to prevent companies imposing them on low-wage workers. Non-competes, originally aimed at top-level talent to keep trade secrets and to protect long-standing relationships with clients, have spread to 18 percent of the workforce — some 30 million employees. Non-competes, as they’re called, originally aimed at top-level talent to keep trade secrets and to protect long-standing relationships with clients, have spread to 18 percent of the workforce — some 30 million employees, according to a 2016 report by the U.S. Treasury Department. Thus the debate in legislatures has been over those at the low end of the wage scale — contracts that might prevent a former McDonald’s worker from flipping a Burger King Whopper, an ex-Macy’s employee from ringing up sales at Target. That worry — detailed in the 2016 Treasury report — is that such agreements limit the free market for labor without really protecting any legitimate interest of the employer, aside from hanging on to workers during a labor shortage without upping their wages. Yet, there is very little evidence that low-wage contract chain workers are being tied to their job in the Granite State. Sarah Jane Knoy of the Granite State Organizing Project, who works on such campaigns as Raise the Wage, has yet to come across one. Even NH Sen. David Watters, D-Dover, who plans to reintroduce a bill banning non-competes for low-wage workers, couldn’t come up with a concrete example. “What I heard was anecdotal and mainly from other states,” he said. Lawyers who specialize in the field say they have yet to see such a case in New Hampshire involving retail or fast-food workers. Of course, not many could afford to go to an attorney. If they did, they would learn that such clauses are largely unenforceable here anyway. 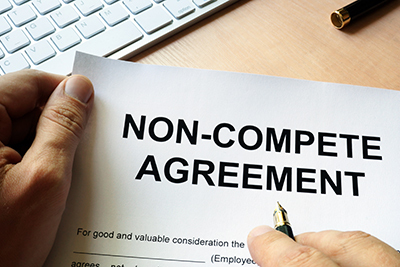 Non-compete case law can be complicated, but there are some simple parameters. They have to be aimed at those who have access to trade secrets or have enough “goodwill” that they could take a substantial amount of business when they leave. And they can’t be too broad (geographically or otherwise) or last too long. And whatever harm they could do to the employer has to be balanced to the potential harm they could cause the employee by restricting employment opportunities. And — as enshrined in New Hampshire statute — they have to be signed as part of the hiring or promotion process, not later, when the new employee doesn’t feel he has much of a choice. In addition, if a non-compete goes too far, a judge could just narrow it. But he or she could also throw it out altogether if an employer overreaches. Finally, non-competes should not be confused with non-disclosure or anti-solicitation agreements, which are generally upheld by the courts. That was the situation in Massachusetts until August, when legislators there passed a law that went into effect on Oct. 1. Under the law, employers can no longer impose non-competes on hourly workers or on anyone who is fired without good cause. Contracts can’t last more than a year. And employers have to actually pay workers half their salary for the period when they are restricted (or some other negotiated remuneration). The law covers those who reside or work in the Bay State, meaning it could affect New Hampshire residents who work in Massachusetts, “though that hasn’t been tested yet,” said Jennifer Parent, an attorney with McLane Middleton, based in Manchester. The key is whether employers have a legitimate business interest to protect, said Shilling, who gave the example of hairdressers, who often form close relationships with their clients who might follow them to a competitor. That has to be balanced with the ability to get a job in their field without having to move out of town. Courts sometimes balance this by limiting the hairdresser from not soliciting, or perhaps not even accepting, old clients for a period of time, but allowing them to go after new ones. Things get even more trickery when it comes to a landscaping business, Shilling said. A non-compete doesn’t make sense for the new guy who spreads fertilizer. But what about the person with 10 years of experience who built up a relationship with certain customers? The problem is you have to sign your non-competes when hiring, and you never know who is going to leave in a few months, and who is going to be your superstar. “Employers will sometimes just go overboard and have everyone sign the agreements,” Shilling said. It is in these gray areas where low-wage workers might get stuck with non-competes — not in big chains with corporate lawyers who should know better, Shilling said. But most low-wage workers won’t or can’t go running to a lawyer if they’re told they can’t work for a rival, said Senator Watters. They’ll just stay with their employer or leave the field. That’s why last year he introduced Senate Bill 423, which would have prohibited companies from entering into such agreements with employees earning less than twice the federal minimum wage. The bill failed, though it did have some Republican support at one point. Indeed, the Senate passed a bill last session banning non-compete with nurses. The measure was sponsored by the conservative former Sen. Andy Sanborn, R-Bedford, and signed into law by Gov. Chris Sununu. Watters said he plans to introduce a new bill — with a cutoff of $15 an hour — when the session starts in January, with a Legislature that now has a Democratic majority, presumably giving it a better chance at passage. Even if Watters’s bill does pass, non-competes will still be a point of contention for high-level employees and still mean extensive litigation. Take the aforementioned Woodbury case, being heard in U.S. District Court in Concord. The head of Buttine Underwriters Agency, also a former HCC employee, recruited the 20-year veteran to head up Prize and Promotion Insurance Services, a unit that will insure companies running promotions or give incentive payouts to athletes if they meet certain goals. The insurance company assesses the risk and reimburses the company if the payout exceeds a certain amount. This is what Woodbury was doing at HCC, with which Woodbury signed non-compete agreements twice, the last time in 2001, as part of an incentive and stock option deal. Woodbury, according to Judge Landya McCafferty’s order granting HCC a partial preliminary injunction, actually shared HCC’s financial information with his future employer, including the book of business he could bring. “Woodbury narrowly defined a ‘book of business’ to mean ‘business that would want to work with me.’ He testified that he would not be taking clients away from HCC once he sought out their business for Buttine, because those clients were free to choose their insurer,” wrote McCafferty. Before he left HCC, Woodbury compiled a list of email addresses regarding an HCC promotion and photos of the company’s current budget. He said he kept the photo to himself. But he did go after HCC clients, even during the litigation. “You haven’t stopped have you? You’re still knocking on doors, aren’t you?” he was asked. But Woodbury and his attorneys maintained that the agreements were not enforceable, first because they were made with another corporate entity that eventually became HCC and second because they were overly broad. And he told his former company so, returning a $12,000 severance payment because he didn’t want it to seem like he was accepting the non-compete agreement. McCafferty ruled at the end of January that a non-solicitation agreement “is likely valid and enforceable” and HCC was likely to prove that it was breached. But she didn’t grant the injunction because there was no proof of immediate harm because HCC waited so long to go to court, and the damage, which will be determined later, has already been done. The court also forbid Woodbury from disclosing any confidential information, and the parties settled after that. The terms are confidential. Baker, the president of Perspecta Trust, was also a high-level employee in a specialty field, in this case managing trusts of clients worth more than $100 million. The company was founded and led by Paul Montrone, an executive best known for founding, and later selling, Fisher Scientific International. In October, Baker filed a disability anti-discrimination suit against Montrone and Perspecta for firing him last December — charges that Montrone has denied. But Baker had already filed a Superior Court suit in January against his former employer over a non-compete contract. Baker had expressed concern about the non-compete when he was first hired in May 2009, since it limited his activities worldwide for two years after leaving, according to his affidavit. Baker thought he got a verbal reassurance that it would be narrowed to New Hampshire but the one he was presented after moving encompassed. The company expanded that convents in 2012 and 2016, tying it to equity awards. Baker tried to renegotiate the deal before he left to no avail. After Baker was let go, he said he spoke “with numerous professional recruiters who, upon learning of the expansiveness of my non-compete obligations, refused to continue discussions with me and advise me to ‘sort out the non-compete first,’ before moving forward in any capacity,” according to the affidavit. The agreement is overbroad, argued Terri Pastori, Baker’s attorney, because it prevented Baker from not only soliciting Perspecta’s current clients but prospective clients. But Perspecta argued the company cultivated the limited pool of high-net-worth individuals for years before getting them to set up a trust. Baker could go after other trusts or be involved in other financial services. Neither Baker nor Pastori would comment on the confidential settlement, though when asked, Baker said that he is now able to work in his field. “Over-reaching non-compete terms serve not to protect the interests of a company, but instead act as a punitive measure designed to restrict an employee’s ability to be hired elsewhere,” Baker said. 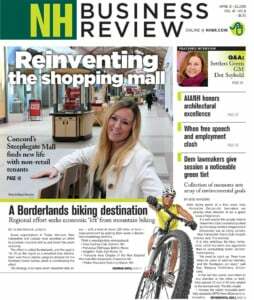 Montrone did not comment by NH Business Review deadline.